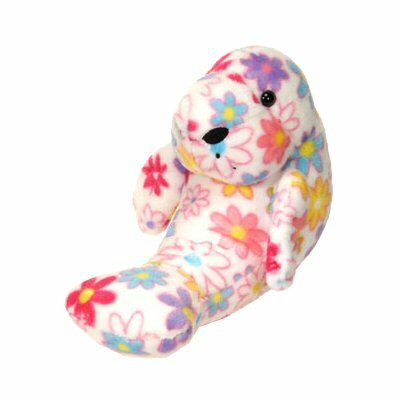 This adorable plush manatee is part of the Fiesta Pick Me collection as is evidenced by its bright and colorful flowery fabric. Soft to the touch and cuddly to the hug, this whimsical manatee stuffed animal has fun and floppy fins (say that 6 times fast LOL) and a detailed face with large nostrils and sweet eyes. Echoed in every delightful detail, this stuffed manatee conveys... "just one look in my sweet face and you'll definitely want to Pick Me!" Fun Facts about Manatees: Did you know that in 1975, Florida chose the manatee as its official state marine animal? Chit Chat is a cuddly otter stuffed animal with soft brown fur, big webbed feet, and fun wild whiskers. Key Lime, this adorable Li'l Sweet & Sassy stuffed sea horse, has soft fur and a rainbow of hearts around beautiful blue eyes. This fun Handfuls stuffed sea turtle has a soft green body, white tummy, floppy fins, and sweet brown eyes.